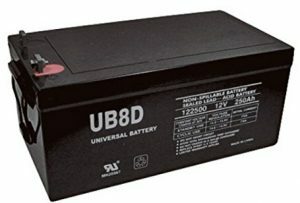 The newest battery style on the market is an 8D battery. Many swear they are the best that you can have while others are still questioning what they really are. Lucky for you, we have done the dirty work. We are going to try and explain what makes the difference between traditional batteries and 8D deep cycle batteries. When you look at a marine battery that will last, you have two options. 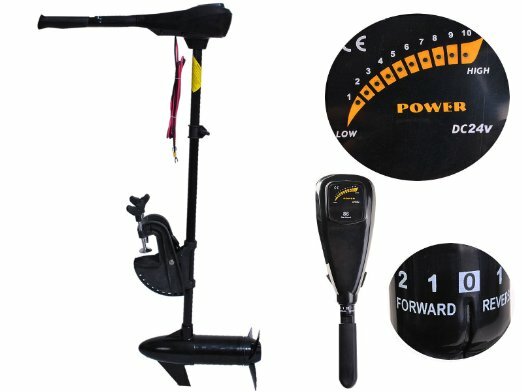 You can choose a good starting battery, which is ideal for powering up the electronics and motor of your boat, but cannot handle running for extended periods of time. Deep cycle batteries are not great at starting because they have fewer plates than the starting battery, but they are able to handle a steady pull for an extended period of time. 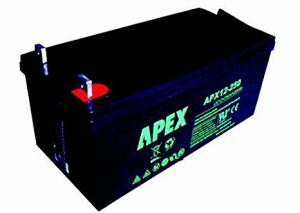 The 8D deep cycle batteries are unique in the fact that they are able to handle a little more of both starting and deep cycles. They even have a higher Amp-Hour capacity than normal deep cycles. This is due to the fact that they have thicker plates than normal batteries, heavier support grids, thicker than normal insulating separators, and more of the total lead that makes batteries work. 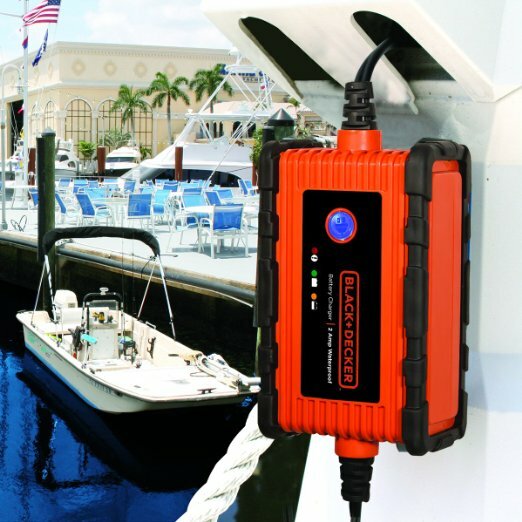 In short, they are designed to be able to hold up to deeper discharges than all other available batteries on the market for the marine environment. 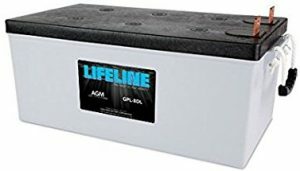 The possible downside for some people is that they do weigh more than your average lead-acid batteries, even those that are of a comparable size. This is due to the fact that they do contain more lead. This gives them a much longer service life. This often means that they will have rope handles at each end. However, they are priced lower if you consider the pound for pound aspect of the battery. It isn’t just the amount of power that they have that will look different with these batteries. Most have the rope handles, but some may also have holes for you to put ropes if you want them. They typically have a flat top with a positive and negative post on one end, whereas most standard 12-volt batteries have a post on each end of the battery. To show you more about the differences between traditional batteries and the 8D deep cycle batteries, we suggest you take a look at the battery choices below. This will give you a better idea of what they are capable of and perhaps help you in choosing the best one. The shipping weight for this battery is 160.9 pounds. 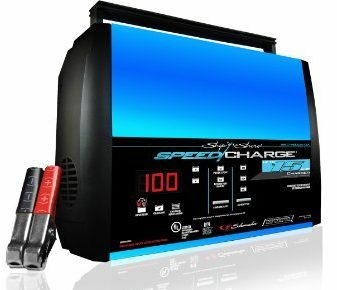 It has a capacity of 250 Ah and measures in at 20.47 inches. Some owners say that it works great for all of their needs, including those who want to use it as a battery for their solar power needs. This battery comes with a 5-year prorated/1yr replacement warranty. It measures in at 20.76 x 10.89 x 9.65 inches. It has 255 Ah. This one also has an L blade with M8 hardware. It weighs in at approximately. 162 pounds. 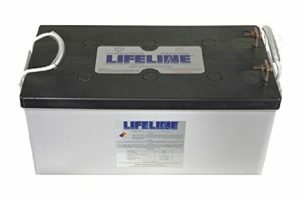 This battery is great for all types of applications including RVs, solar, and marine use. It is lighter than other 8D batteries at approximately 150 pounds. It is also backed by an 18-month warranty. Price wise, it is also more affordable than some of the other choices. 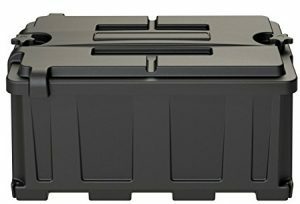 This battery box is designed for use with 8D batteries. 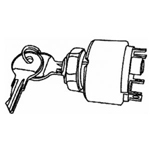 It is commercial grade and can be used on your RV, boat, and vehicle. This means that it can be used in rugged environments and protect your battery from potential harm. It will also ensure that spilled acid does not get released into the environment.